[NEW] Added support of graphical filters in columns. [NEW] Added the following filters suitable for most applications to Dapfor.Wpf.dll library. The filter displays a lits of values discovered in grid cells in the specified column. 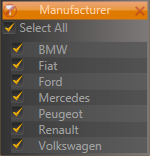 Users can choose one or several values from the proposed list. To cancel a filter for this column you may click the crossed filter icon in the upper left corner. The filter displays a lits of values discovered in grid cells in the specified column. Users can choose a value from the proposed list. To cancel filtering you can click a crossed filter icon in the upper left corner or choose <All>. You can use this filter for all types implementing the IComparable interface. This includes all whole number types (Int32, Byte, …), with floating comma (Double, Decimal), dates DateTime, TimeSpan, strings (String) and many others. 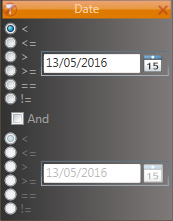 You can use it to filter rows by set dates. You can set multiple conditions. [NEW] Added support for custom filters where developers can also add them to columns. [NEW] Added support of ObservableCollection<T>. The grid also supports this collection at all hierarchy levels enabling dynamic addition of data on any level. [NEW] Added GridControl.SettingsFocus.Enabled property to prevent from focus displaying. [NEW] Added Column.Tag property to store any user-defined information. [NEW] Improved DesidedSize definition in GridControl. [BUG] Fixed an error involving incorrect brush definition for alternative row in some cases. [BUG] Fixed an error with scrolled cells occassionally failing to update their DataTemplate. [BUG] Fixed margin control set in Column.CellMargin.